Welcome to the Massachusetts Woodlands Institute. 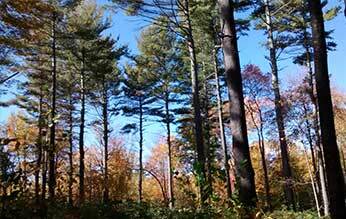 The Massachusetts Woodlands Institute (MWI) is a non-profit organization that encourages and assists landowners in responsibly managing their woodlands. We believe that taking an active role in managing your woods will benefit wildlife, the local community and economy, and can provide you with financial, recreational, and personal rewards. 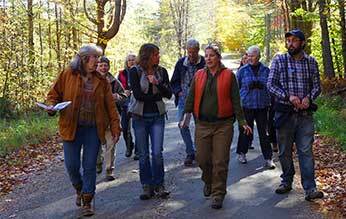 MWI is subsidiary organization of the Franklin Land Trust, and is housed at shared offices in Shelburne Falls, MA. By working with FLT, we are able to offer expertise and assistance to landowners about permanently conserving their land, as well as managing and caring for the land. We host the Western Mass Wood website with searchable listings, stories and marketplace for local wood products. Licensed consulting foresters will work with you to develop a 10 year Forest Stewardship Plan based on your stewardship goals. Consulting foresters will recommend actions to protect or increase the environmental values of the land while yielding desired social or economic benefits. 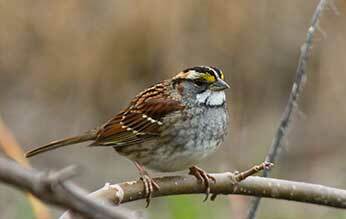 The key to maintaining our diversity of wildlife lies in maintaining a diversity of habitats. One of the easiest ways to evaluate the complex web that thrives in our forests is to measure the thing that relies on the complex system, but is easy to find – the birds. When we protect bird communities, we protect the systems that bring us those communities. The USDA’s Natural Resource Conservation Service has set aside funds to assist landowners in 28 towns in northwest Massachusetts through a new regional partnership called the Western Massachusetts Woodlands for Wildlife. Landowners in this region will receive help applying for NRCS funds from the Massachusetts Forest Alliance. The Massachusetts Woodlands Institute is a non-profit organization that encourages and assists landowners in responsibly managing their woodlands. 2018 © Mass Woodlands Institue - All Rights Reserved.